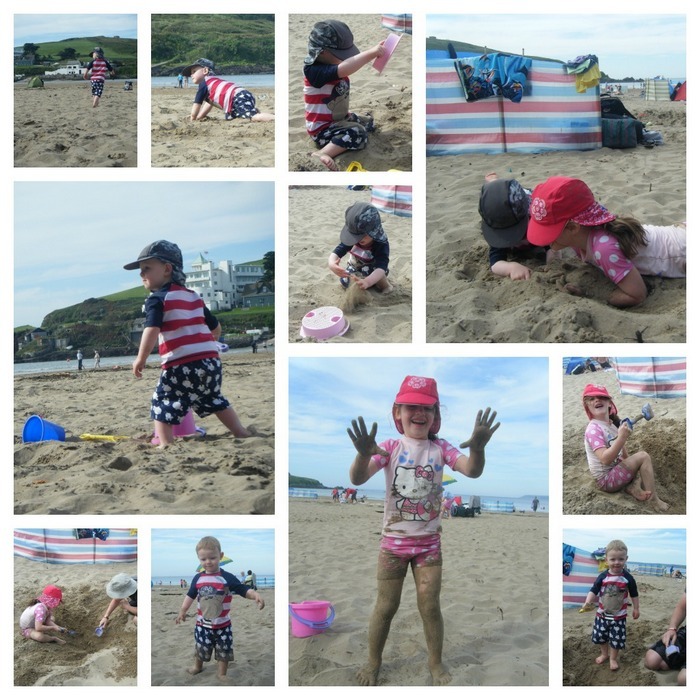 With the gorgeous sunshine upon us last week and knowing it wouldn’t last we decided to fit in day at the beach – probably the last opportunity we would have this year. Having decided to descend upon Bigbury on Sea we set off early with Miss M and Mister B no knowledge of where we were going. The constant whines of “Are we nearly there yet?” and “It’s a long, long way” soon ensued but the delight upon there faces when we parked up were most definitely worth it. With buckets and spades at the ready we headed down the steps to the powdery sandy beach. They were both thrilled to see the sand and run free across the beach to have a paddle in the sea. It was lovely to see them having such fun and enjoying the outdoors. At lunchtime we tucked into a homemade picnic then set about burying daddy’s legs in the sand!! The beach got steadily busier throughout the day as the sun held high but what a lovely September day and the children thoroughly enjoyed themselves. Late afternoon we set off home and within minutes of driving off through the country lanes I turned around to find two sleeping beauties – aww my little babies were exhausted and just couldn’t keep their eyelids open any longer. We had a lovely family day out and with family days being limited with Miss M having started school and daddy working lots of weekends it was nice to spend time all together, having fun in the sun! !